In a general sense, what is it the day like when you’re a contestant on Jeopardy? It’s a very long, very stressful day that passes by in a complete blur. You start out by taking a shuttle to the studio from the hotel with the rest of the contestants at about 7am. Once at the studio, the next several hours are taken up with filling out a lot of forms, meeting the production staff, and getting some time to practice on the actual stage, with the actual buzzers. After that, they randomly pick contestants for the first game and the rest get to sit up in a sequestered area of the audience and watch. I was a bit surprised that I was allowed to watch all of the games that were filmed before mine, it was certainly preferable to just sitting nervously in a green room! Each episode goes by incredibly fast (they film pretty much in real time), and they manage to film five episodes in a day (my game was the last of the day). It’s a pretty exhausting and nerve-wracking experience, but it’s definitely worth it. Is there anything funny or interesting that happened during filming that you’d like to share? By far the most memorable thing that happened while I was there is something that unfortunately the audience at home will never get to see. In the first game of the day, during the interview portion, Alex asked one of the contestants about a time they fell asleep in the Tower of London. She then proceeded to tell a story about a time when she bribed a guard to let her and a friend sleep overnight in Anne Boleyn’s cell. When he then moved on to the next contestant, he realized that he had gotten the information cards swapped and asked the wrong question to the wrong contestant about the Tower of London! She had decided to just roll with it, and completely made up a story on the spot that turned out to be more exciting than the real one (which involved some jet lag and a nap during a tour). They had to go back, reset, and reshoot the interview for the show. Later on, that contestant actually got a question with the answer of Anne Boleyn; the entire audience in the studio laughed, and those watching at home had no idea why. Tell us about watching yourself on TV. Was it weird? It was incredibly weird (mainly because I’ve never liked the way that my voice sounds when I hear a recording of it), but also very fun. We were able to have a large watch party at the bar where we used to play trivia and joined by a large group of friends. They were great; cheering any time I got a question right, booing when my competition did, and overall being pretty proud of me. In all, it served as a great way to cap off the whole experience. I think every Jeopardy! contestant walks away kicking himself about some error or misspoken answer. Your episode was rife with these from all three contestants. Now that you've had a year to reflect, what still sticks in your mind? A year later, I’m still kicking myself over the two big mistakes that I made in my appearance: accidentally pluralizing the title of Sunday (not Sundays) In The Park With George and the flub over the acronym “DNA”. In both cases, it’s painful since they were questions that I clearly knew the answer to, but messed up either a tiny detail, or just didn’t fully understand the question. Everyone who knows you even a little bit, knows how much you love television and pop culture. Our heads almost exploded when we saw your Final Jeopardy category "TV in the 2000s." What was going through your mind? GAH! WHY AM NOT IN THE LEAD!!! Haha. It was pretty exciting to get a category where I was incredibly confident in my knowledge. I had hoped that they question would be an incredibly obscure one, but wasn’t too disappointed to at least get one that I was absolutely sure I knew the answer to. Having been able to talk the contestants throughout the day, I knew that the other competitor, Sam, did not that much about recent pop-culture and would likely answer incorrectly. My only hope was the Shawn had been too busy studying for law school to know too much about TV, but being around the same age as me, he was unfortunately familiar with How I Met Your Mother. Still, it was a nice relief to be able to put down a very confident wager for Final Jeopardy (much better than if the category has been anything poetry related). We had fun looking for social media reactions to your Jeopardy! appearance. 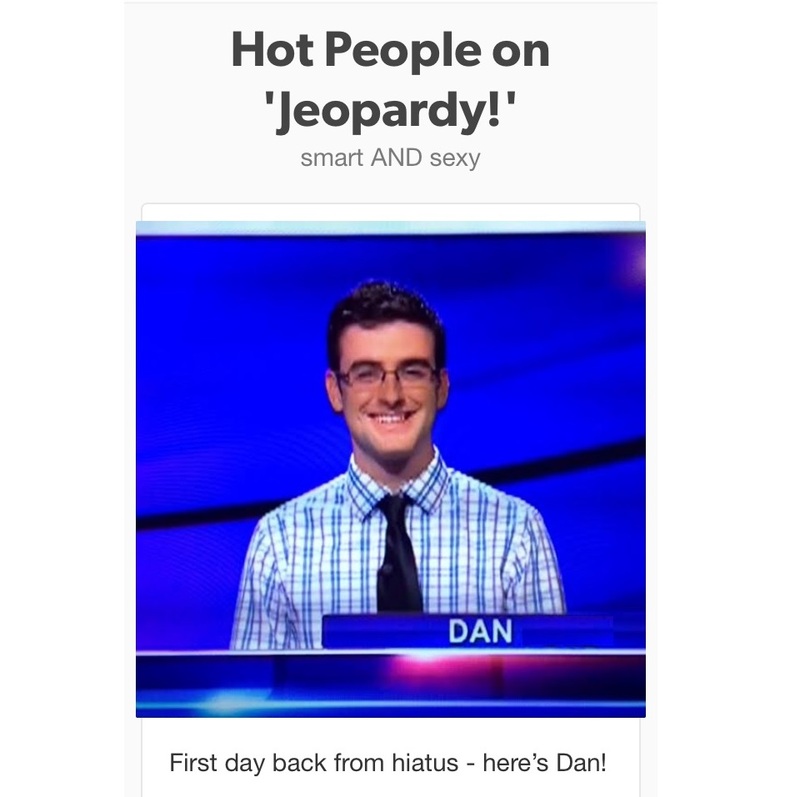 My favorite was seeing you on the "Jeopardy Hotties" Tumblr. What was your favorite? In all honesty, I should have gotten that Provincetown question! My brother goes there for vacation in the summer! Other than that, it was nice seeing that other people thought I got a little bit hosed on the question about DNA. Overall, how was the experience? Would you do it again? 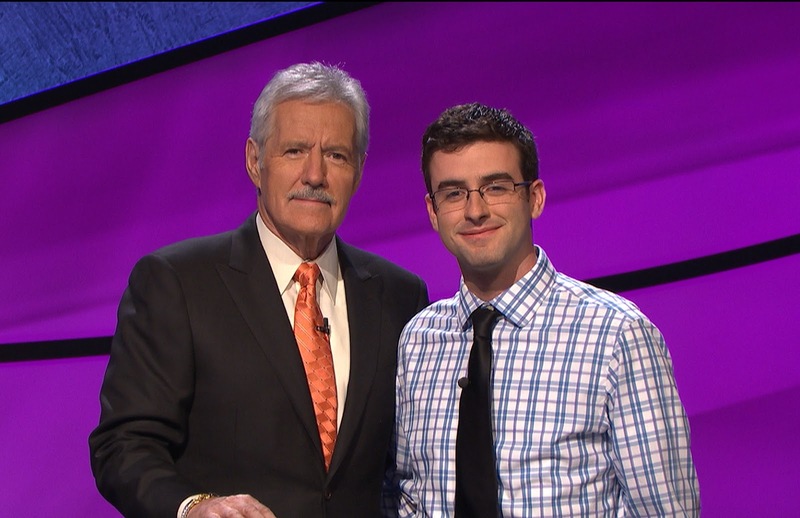 I would absolutely do it again…unfortunately I can’t, at least not while Alex Trebek is the host! Sadly, one of the many forms that you sign as a contestant states that you can’t make a return appearance on the show as long as the host remains the same. Still, it was a really fun time, and I would encourage anyone to try out. What do you have to lose?